Welcome to Maundy Thursday. Maundy comes from Mandatum, which is the Latin word for “command” or “mandate”, and the day is called Maundy Thursday because on the night before his death Jesus gave his disciples a new command. “…that you love one another: just as I have loved you, you also are to love one another” (John 13:34 ESV). There are very few things that we have in common with every other human being on this planet but one that I am sure of, is to love and to be loved. Ironically, as much as we long to love and be loved, it is one of the most difficult things to truly experience in life. Perhaps it’s because we expect and desire a love that leads to a “happily ever after” or to find a love that is “my soulmate”. Both are fantasies that don’t exist on this side of eternity. Yet, we long to experience this kind of all consuming love and are often disappointed when we don’t. On the last night before his crucifixion, Jesus shared a Passover meal, and at this meal, Jesus foretold how his closest friends will deny him and even how one will betray him. But Peter and the rest adamantly refused such a possibility only to find out, that as always, Jesus was right. 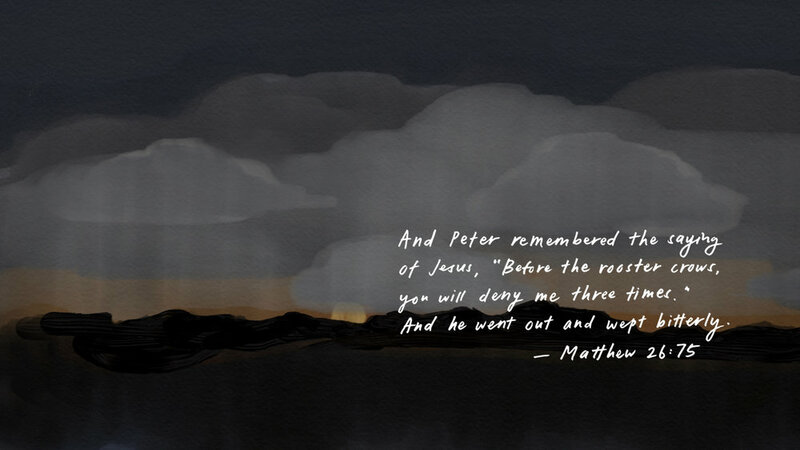 Upon this realization, it says in Matthew’s gospel that Peter “wept bitterly”. And with such pain, and sorrow, Peter realized something so amazing and powerful that changed his life forever: that Jesus knew what was about to happen; that Jesus foretold the coming denial and betrayal and still prayed for them; but most of all, that Jesus still loved them and spoke of what to do when they returned and gathered again as His disciples! Jesus said, “Simon, Simon, behold, Satan demanded to have you, that he might sift you like wheat, but I have prayed for you that your faith may not fail. And when you have turned again, strengthen your brothers.” Jesus knew that the test was coming. He even told them but they couldn’t see in themselves what Jesus saw in them. I don’t know about you but I find it difficult, impossible, to pray for those who hurt me, not to mention, love them. The unquenchable love of Christ has no limit, no condition and no requirement, simply because none can meet them. I don’t know any other person who could love us this way. This Maundy Thursday, let’s remember how we have been loved with an unquenchable love and remember that His call to love was a “command” or a “mandate” and not just a request. This command is simply a response to live out a love with which we have been loved. What is true about Him and is now true about us, and so we are to “love out” to others how we have been loved. May we turn to love Him and then to love and “strengthen” our brothers and sisters to follow our Beloved. This concludes our Passion Week devotionals, but please join us for a final Passion Week reflection and time of worship at our Good Friday Service tomorrow at 7:30pm at the Artesia Campus Main Sanctuary. We hope to see you there!